Gomaco Trolley Company, located in Ida Grove, Iowa, is the manufacturer of authentic vintage trolley cars which match the precision and quality craftsmanship of yesterday and incorporate the engineering technology of today. Gomaco can provide you with trolley manufacturing and engineering consultation on restoration or renovation of existing trolley cars or in the manufacturing of new trolley cars. Craftsmanship - Gomaco Trolley Company takes pride in the craftsmanship that goes into every manufactured trolley. The goal is to keep the trolley cars as authentic as possible and to match the quality workmanship that went into the trolleys of the past. This has been accomplished along with using modern technology to improve the durability. The framework is built with steel. Gomaco also provides authentic brass parts from our foundry and wood beauty from our highly skilled craftsmen. Gomaco Trolley Company builds brass parts to meet all standard trolley requirements and to provide exact replicas cast from dies of authentic trolley parts. If you are in need of a special part, Gomaco will make a die and build exactly what you need. Gomaco trolley cars are built to meet requirements of existing lines. The trolleys are presently running on standard 600 volt D.C. systems and can be built to be compatible with light rail vehicle 750 volt D.C. systems. Pride In Engineering - Gomaco engineering has designed the trolley operator's station for ease of operation and safety. The station is designed for excellent visibility and all controls are within easy reach of the operator. The Perfect Parts - Gomaco offers a large assortment of parts and accessories for trolley restoration, renovation and collectors of trolley memorabilia. Featured items are built from quality wood, iron and steel. Gomaco's Trolley Foundry will build brass parts to provide exact replicas cast from dies of authentic trolley parts from around the world. Gomaco Trolley Company specializes in restoration or renovation of your trolley truck assembly. Gomaco also will build the seat assembly with the finest craftsmanship in the world, whether you choose cane seats or wooden seats with backs of ash and cherry in a variegated pattern and ash seat bottoms. Precision craftsmanship combined with quality materials also provide a beautiful interior and exterior design for trolley doors and windows. Unmatched Precision - Exact replicas can be built based on trolley photos. Gomaco Trolley Company built an exact replica of the 1902 J.G. Brill trolley car for the Lowell National Historical Park in Lowell, Massachusetts, in 1984 based on a black and white photograph. Gomaco's trolleys based on old world craftsmanship can be seen riding the rails from coast to coast in the United States. Trolley attractions are evident in Massachusetts, Tennessee, Colorado, Oregon, North Carolina, Arkansas, Florida and Iowa. Trolleys to be refurbished have come from as far away as Australia and Italy. 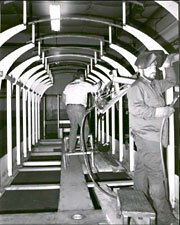 An inside view of a trolley under construction. 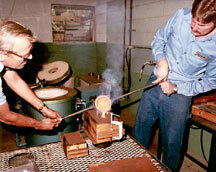 Gomaco's foundry is used for the brass casting of various custom parts. Intricate details are seen on this 15-bench, open-style trolley in the shop. 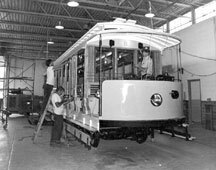 Gomaco Trolley Company technicians put the final touches on this trolley's bonnet. 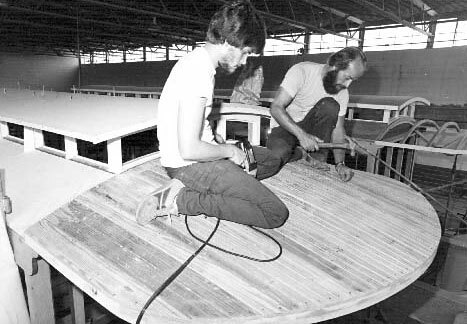 1982-1984: Gomaco Trolley Company began building trolley cars in 1982 with a contract from the Department of the Interior. The contract called for the construction of two 15-bench, open-style trolley cars. These cars were replicas of the J.G. Brill car built in 1902 and were of the 1597-1600 series. In 1984, the cars, numbered #1601 and #1602, were delivered to the Lowell National Historical Park in Lowell, Massachusetts. 1986: One replica of a 15-bench open-style trolley car was built and sent to the Mason City-Clear Lake Historical Railway Society in Mason City, Iowa. Trolley car number #1976 ran between the two cities for several years, and is now located in Tampa, Florida. 1987: A third car was delivered to the Lowell Historical National Park. This car was a semi-convertible enclosed car and was a replica of the 4100 series built in 1912 by the St. Louis and Laconia Car Company. 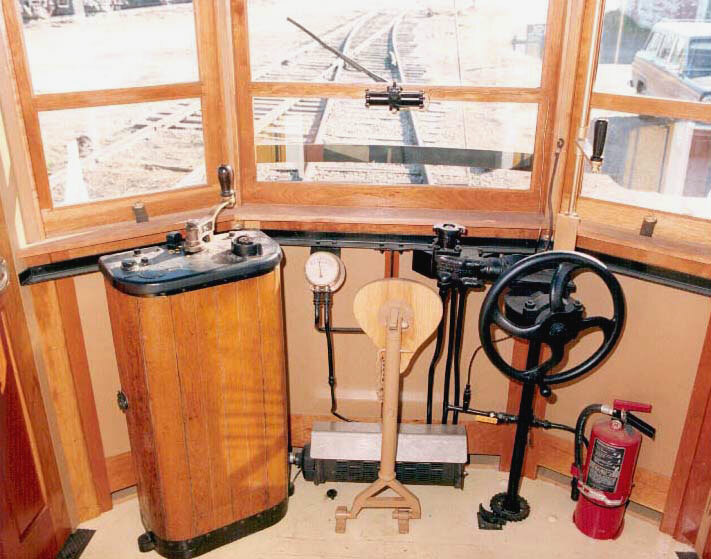 The car, #4131, was equipped with cane seats which included heaters under each seat, making the car ideal for use in cold weather. 1988: One replica 15-bench open-style trolley was built for local use. This was a self-propelled trolley with an on-board generator unit. Car #1977 was then leased to the Denver Rail Heritage Society in Denver, Colorado, in 1989. 1990-1992: A set of four replica Council Crest trolley cars were constructed to operate in downtown Portland, Oregon, on the Tri-Met MAX light rail line. These cars, numbered #511, #512, #513 and #514, are faithful reproductions of the 500 series car manufactured by J.G. Brill company for the Portland Traction Company in the early 1900s. In 2014, trolleys #511 and #512 went to St. Louis Loop Trolley Transportation Development District, in St. Louis, Missouri, and cars #513 and #514 went to the Oregon Electric Railway Historical Society to run on the Willamette Shore Trolley Line in Lake Oswego, Oregon. 1993: A single-truck, semi-convertible enclosed car was built for display at the APTA International Public Transit Expo '93. This trolley car, #1979, which is also currently owned by MATA in Memphis, Tennessee, is a shortened version of the 4100 series built by the St. Louis and Laconia Car Company. 1994-1997: Six Melbourne w-class trolleys, numbered #234, #353, #539, #540, #545 and #553, were obtained from Melbourne, Australia. They were completely renovated from "rail to wire" and are presently owned and operated by MATA in Memphis, Tennessee. 1998-2001: Gomaco Trolley Company built eight replica Birney trolleys, numbered #428, #429, #430, #431, #432, #433, #434 and #435, for HARTline in Tampa, Florida. One additional Birney trolley, #436, was completed and delivered in 2005. 2000-2001: Expansion of the Gomaco Trolley Company building to 34,280 square feet. 2001-2002: Gomaco Trolley Company constructed three replica Birney trolleys for the Central Arkansas Transit Authority in Little Rock, Arkansas. Delivery of the cars, numbered #408, #409 and #410, was taken by early spring 2002. Two additional Birney trolleys, #411 and #412, were completed and delivered in 2006. 2002-2003: Fresno Metro Flood Control District requested a static, single-truck replica Birney trolley for a display in Trolley Creek Park in Fresno, California. Car #28 was delivered in the spring of 2003. 2001-2004: In August 2001, an order was received from Memphis Area Transit Authority to recondition three Melbourne trolley cars and build a replica Birney trolley. Melbourne cars, #452, #454, and #455, were delivered in the summer of 2003, and replica Birney trolley #453 was delivered in March 2004. 2002: Peter Witt trolley #1945 was repainted and given a new home in Mount Pleasant, Iowa. 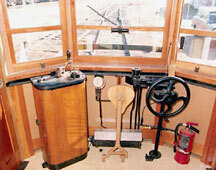 The trolley's interior is still in its original condition and minor adjustments were made to the trucks. 2003-2004: Construction of three replica Birney trolleys for the Charlotte Area Transit System. Cars #91, #92 and #93 were delivered to Charlotte, North Carolina, in the summer and fall of 2004. 2005: Gomaco Trolley Company reconditioned two Peter Witt trolleys for Citizens For Modern Transit in St. Louis, Missouri. Trolleys #1351 and #1352 were completed and delivered in August 2005. 2006: Gomaco Trolley Company constructed a "trolley-style" subway entrance for the University of Philadelphia in Pennsylvania in 2006. 2007: A 3,780 foot expansion project brought the Gomaco Trolley Company building to 38,060 square feet. 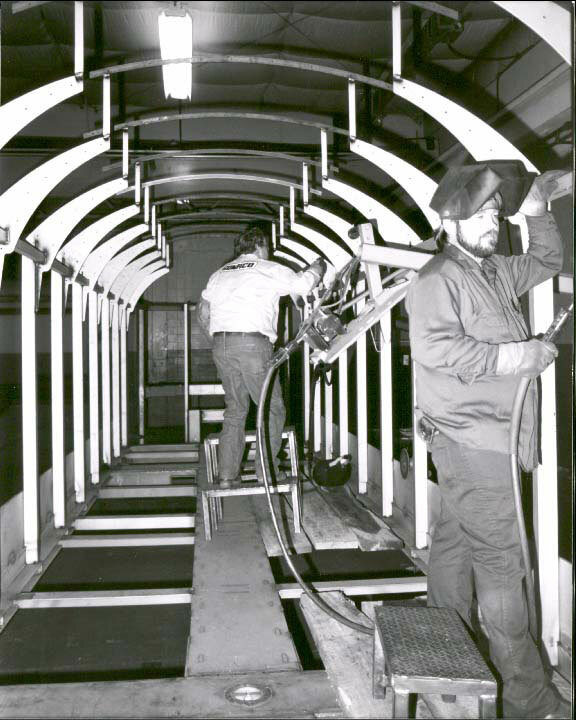 This expansion included the construction of an open "pit" for technicians to easily work underneath trolleys, and an enhanced paint preparation and paint area. 2007: Single-truck trolley #1979 and Melbourne trolley #540 from Memphis, Tennessee, were rebuilt. 2007-2008: Gomaco Trolley Company constructed two open-style trolleys for the "Americana At Brand" project in Glendale, California. The first trolley is battery-powered and 33.5 foot long, and the second, unpowered trolley, is 22 feet long and pulled behind the first trolley. 2008: Gomaco Trolley Company reconditioned double-decker trolley #1759 for an outdoor shopping area in Los Angeles, California. The reconditioning included: total repainting, refinishing all of the original woodwork, installing new flooring and steps, building new brass handrails, rewiring the controls and replacing the controller with the same Gomaco K35G controller as the Americana trolley #1717 in Glendale, California, and repowering the PCC trucks with the appropriate traction motors. 2011: Gomaco Trolley Company introduced Melbourne trolley #799, with the first GTC Double E Hybrid Propulsion System which incorporates both the overhead line and the battery-powered system. It has the ability to switch systems on-the-go as the trolley travels the rail. 2012: A contract was received from the Issaquah Historical Society of Issaquah, Washington, for restoration and repairs to Lisbon Trolley #519, which included repairs to the frame and roof, re-gauging the truck to standard gauge, equipping the car for double-end operation, and providing new windows, wiring, and a fiberglass roof. Trolley #519 had its first season of operation in 2013. 2014: Contracted sale with Taroko Park in Taiwan was received in 2014 for a battery-operated, open-style trolley car. It was delivered in 2015.